We used to hear from Big Tobacco that breathing lots of toxic smoke was nothing to worry about. Now, we're hearing it again—from the dirty energy industry. American Petroleum Institute has been ignoring science, fighting clean energy, and compromising your health. Don't be fooled—and make sure our elected officials aren't, either. Tell Congress: Ignore Dirty Energy's misinformation campaign. Support strong clean air standards. Decades ago, the American public was told that toxic smoke was nothing to worry about, that the dangerous poisons filling our lungs were safe. Now, we're hearing it again, from a brand new industry. 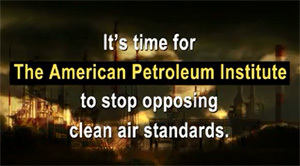 The American Petroleum Institute has been spending ads that ignore science, fight against clean energy, and compromise Americans' health. Their campaign of misinformation isn't just wrong. It's downright dangerous. Please stand against their spin, and support clean energy. Our families and communities are counting on your leadership.